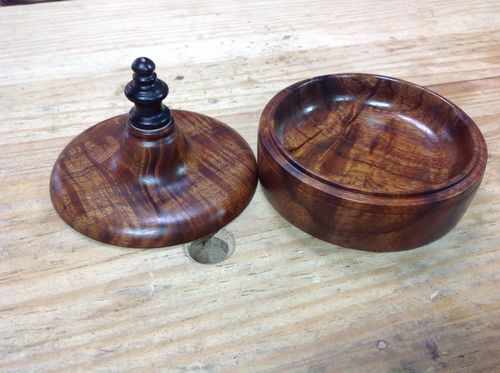 Here is a small turned box with lid and decorative knob; approx 4” in diameter and 4.5” tall. 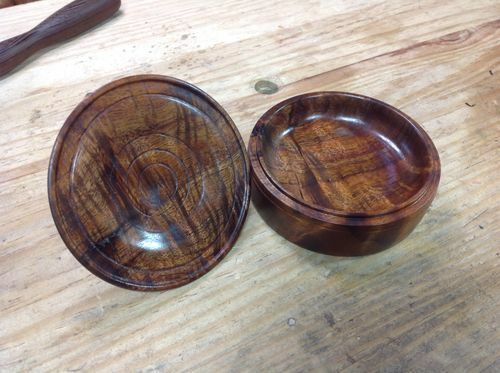 Base is shaped from Koa, knob is Ziricote with vulcanized plastic spacer beneath. There was a large bark inclusion near the top of the box, after removal this was the shape left behind. Simple oil/wax for a finish. Great work worthy of the wood. Simply awesome Terry. That’s some beautiful wood and a spectacular job of turning. Both the wood and the box are absolutely beautiful. Looks great Terry. 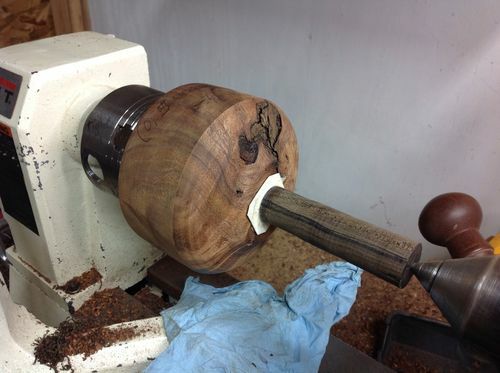 Seems like you have turned a lot of nice things on that first lathe. Any thoughts on upgrading to a bigger/fancier one…or will this one serve all your needs? Good job on a lovely piece of wood! It stinks. Send it to me for proper disposal. PM with address forth coming. That is a really nice box, I’m saving it to try myself someday. How do you turn the inside of the lid after cutting it off? Soft/cole jaws? Beautiful all the way around!!! Always a treat to see your work Terry. Wonderful shape and that wood is just crying out to be handled. Thanks for the kind words, gang. Allen, a few ways to shape the inside of the lid. Yes to cole jaws. I usually grab that tenon sticking out of the top with pen jaws. Then a negative tenon on the inside of the lid helps turn the tip of the knob. I’ll try yo get more photos…have a few glued up for the next few days.